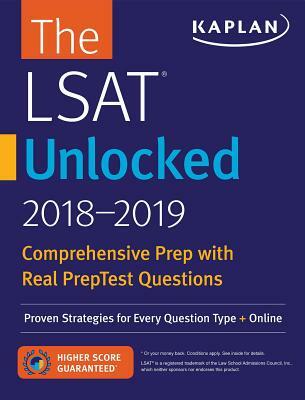 Kaplan's The LSAT Unlocked 2018-2019 features official LSAT practice questions, detailed explanations, and in-depth strategies to help you score higher. An official practice exam will help you get comfortable with the test format, and expert videos and online workshops will help you put your skills into practice so you can face the LSAT with confidence. Kaplan is so certain that The LSAT Unlocked 2018-2019 offers all the knowledge you need to excel on the LSAT that we guarantee it: After studying with the online resources and book, you'll score higher on the LSAT—or you'll get your money back. We know the test: Kaplan's expert LSAT faculty who teach the world's most popular LSAT course, and more people get into law school with a Kaplan LSAT course than all other major test prep companies combined. The previous edition of this book was titled LSAT Premier 2016-2017 with Real Practice Questions.